It feels as if the mountains practically received their season snowfall total just in the month of November hahaha! My wife and I climbed Long Mountain in North Newry on Saturday. We started on the snowmobile trail which crosses the Branch Road. The snowmobile trail was packed and groomed which made the first ~2 miles nice and easy. Then we took a spur toward a cabin and a very short bushwhack that put us up on the Grafton Loop Trail. 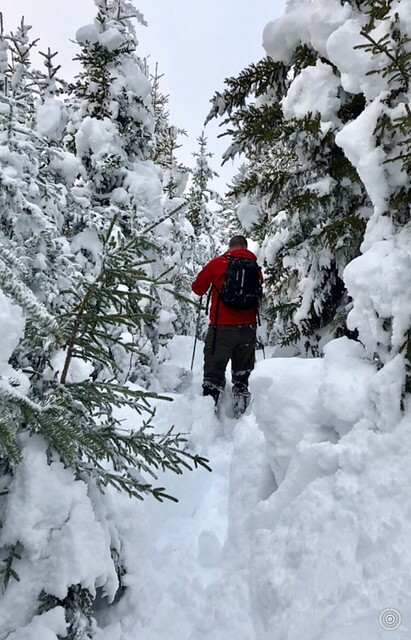 The Trail had not been broken and as we ascended the unbroken snow got deeper, and deeper. It was very slow going. 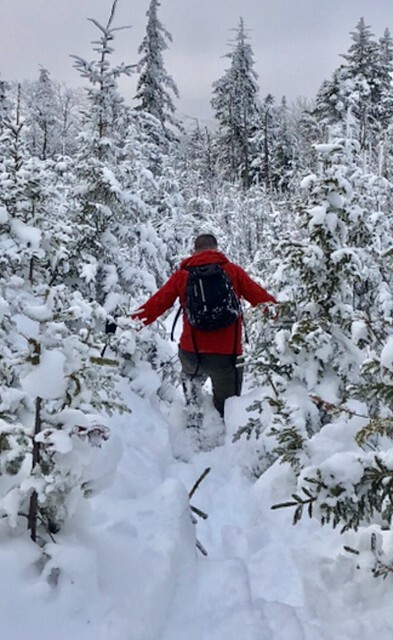 The heavy snow caused drooping conifer branches to obstruct the trail. Then we encountered an area where the heavy snow had taken down a slew of large trees barricading the trail. So it just looked like an impassable wall of snow in front of us. At first, I thought we had accidentally encountered a prototype showcasing for what Trump wants to do at the southern border, because there was almost no getting past the monolithic wall of tangled-branch-rebar-reinforced snow. We had to painstakingly dig out under the trees and ninja-style crawl beneath them to break through to the other side. I think tunneling out of prison would have been easier than getting past this Hoover Dam obstacle on the Grafton Loop Trail. Finally, after dark, we reached the summit of Long Mountain. About 2,200 feet of vertical gain and the entire trip took us 8 hours because of the massively deep snowfall. The descent felt awesome aided by gravity and the packed trail we had worked so hard to create on the way up.